ACRL is pleased to announce the 10-month appointment of Kate L. Ganski of the University of Wisconsin- Milwaukee (UWM) as visiting program officer in support of the association’s Information Literacy Competency Standards for Higher Education Task Force. Ganski will create a communication plan that will help the task force, charged with revising the ACRL Information Literacy Competency Standards for Higher Education, reach a wide variety of constituents outside the library profession and across the higher education community. Working with members of the task force and ACRL staff, she will identify key communication channels and draft ancillary materials to communicate the task force’s revisions of the widely cited standards. Ganski, library instruction coordinator at UWM, has over five years experience working with the vital Information Literacy Competency Standards for Higher Education in curriculum design, assessment and professional presentations. She developed a tiered model of information literacy integration in support of a campus initiative to incorporate the essential learning outcomes from the American Association of Colleges and Universities’ (AAC&U) Liberal Education and America’s Promise. Ganski also brings project management skills to this position, as demonstrated by her work on the creation and integration of UWM Libraries Information Literacy Tutorial. In addition to her work with information literacy issues Ganski has served on many library, campus and professional committees, including serving a term as president of the Chicago Area Theological Library Association. She holds a BS from University of Central Florida and MLS from Southern Connecticut State University. 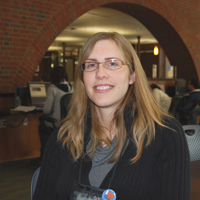 Ganski began working part time with ACRL in early September 2013.